The earliest known record of a Barron ancestor in Covington County is when John Barron, Sr. purchased land in January of 1837. This property was in the NE1I4 of NW1I4 in S10 T5 R16. 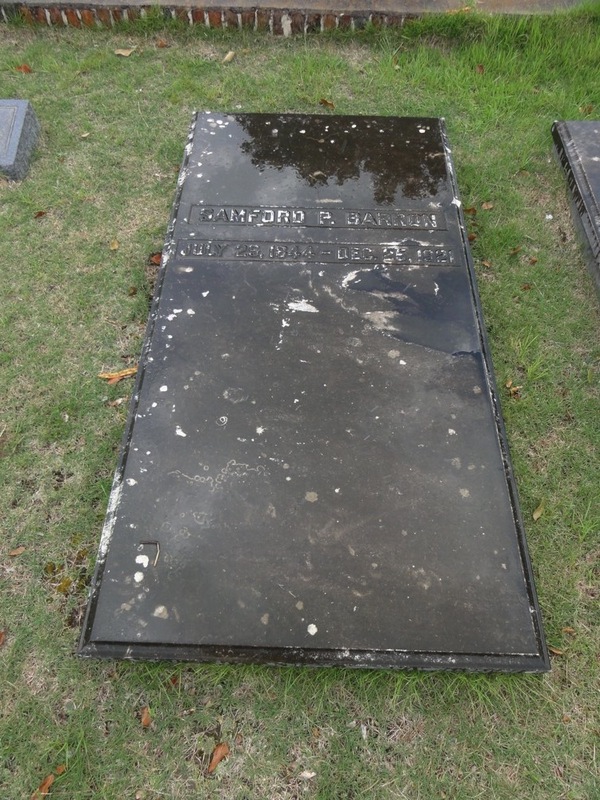 The next reference to a member of the family is for James M. Barron who was listed as owning 5 slaves in 1860. However, he was not listed in the 1850, 1860, or 1870 Census of Covington County. One ancestor who is better known is Dr. Marcus Newton Barron, born in 1819 in Jasper County, Georgia. He eventually settled here is Covington" County and became engaged in the business of the small town. During these years, he managed a cafe on the second floor of the early, two-story saloon, located on the site of the First National Bank Building. Marcus's will was dated April 8, 1882. He and his wife, Mary Ann Selina Perdue, a native of Georgia, reared the following seven children: Samford Plina, b. 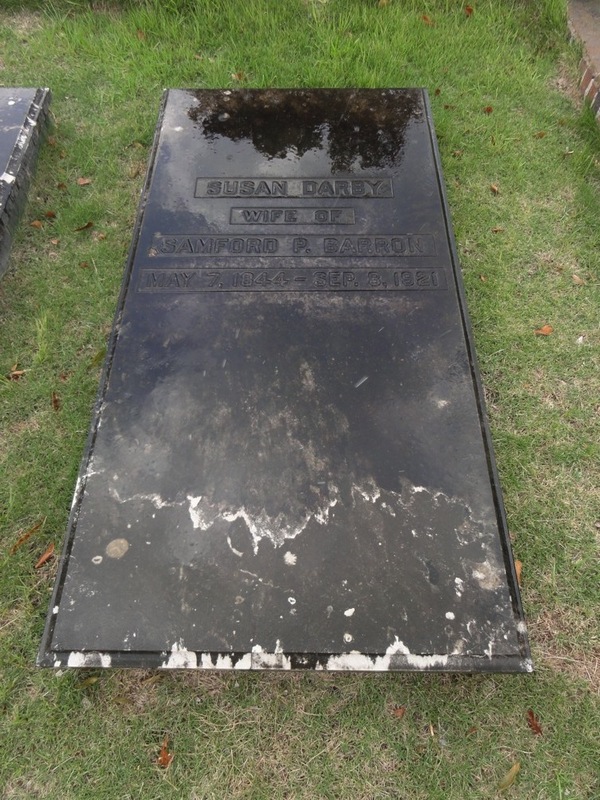 1844, d. 1921, m. Susan Darby; John D., m. Nancy E. Eddins; Sabina A, m. E.G. Chaffin; Joseph Newton, b. 1861, d. 1954, m. Della Powell, b. 1867, d. 1902; Sarah F., m. J.W. Henry; James M., b. 1869, d. 1841. The oldest son, Samford P., was only three years of age when the family moved from Merriweather County, Georgia. to Pike County, Alabama. He grew up several miles outside of Troy in the Henderson community. In 1866, Samford was married to Susan Darby "Tudie," daughter of Jeremiah and Nancy (Stoneworth) Darby of Pike County. Around 1875, the couple moved with their young children to Covington County. Their offspring included the following: Marcus William, b. 1867, d. 1931, m. Ella M. Scott; Mary Alice, b. 1870, d. 1941, m. W.C.W. Cawthon; Jere Darby, b. 1873, d. 1884, single; Fannie Sabina, b. 1875, d. 1960, single; Samford Plina Jr. "Bubba," b. 1879, d. 1963, m. ? ; and Justus Mack, b. 1881, d. 1941, m. Katie Mary Kierce. Samford P. became an influential leader in the growing community of Andalusia. He and Tudie began their livelihood by his teaching a school in their home and her operating a small mercantile business in the home as well. At one point Samford P. served for a short time as clerk of the county. He entered into a business arrangement with Ed Tatum to operate a steamboat, named the Mary Alice, on the Conecuh River between Montezuma and Pensacola. Unfortunately, the river was too shallow to accommodate a loaded boat. So the venture was abandoned. His son, Marcus, had served as clerk for the company. Before moving to this area, Samford P. and his wife, Tudie, had been introduced to the restoration of New Testament Christianity, the Christian Church, or the church of Christ as it is commonly known. They became active members and began immediately, upon arriving in Andalusia, to establish a congregation. They accomplished this during 1875, their first year of residence. The congregation first met in the Barron's home, the Masons' Building, and in an old school building. Later, a meeting place was selected on Dunson Street. By 1900, a nice building was constructed on Church Street at a location just west of the current Regions Bank. This facility served the growing church for more than 50 years. In 1955, the congregation moved to a new brick building on South Three Notch Street. The original auditorium and classrooms have been renovated with additions added to enhance the worship and services of the congregation. For a number of years, the congregation was known by the name of South Three Notch until it was changed to the Central Church of Christ some years earlier. Other congregations have been organized throughout the county from the evangelism of the Barrons and others in this religious group. For some reason after four years, the family, chose to move back to Pike County where they lived for the next nine years. During this period, Samford P. continued his evangelistic efforts. In 1888, the family returned to Andalusia where Samford once again became involved in the community. 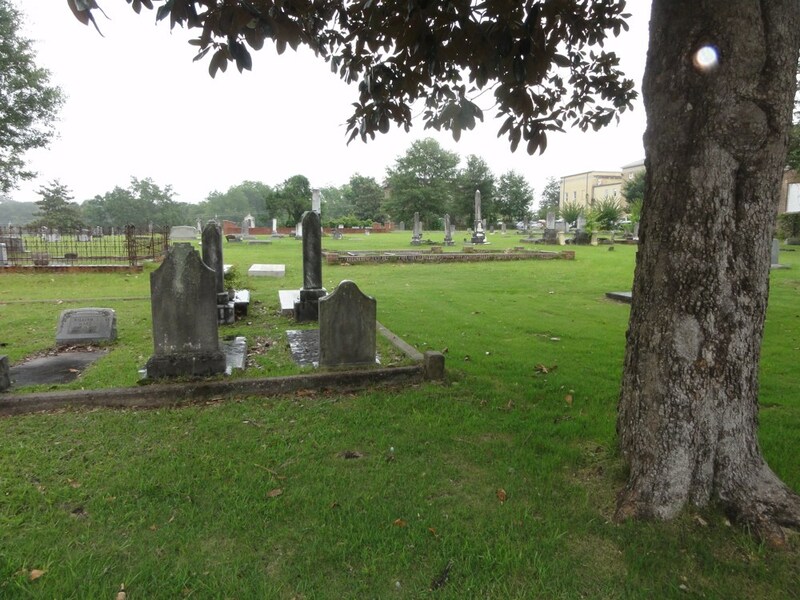 He died on Christmas Day, 1921, and was buried in the Magnolia Cemetery where many descendants have been buried also. Samford P.' s son, Marcus, operated a mercantile business in Andalusia before he moved to Florida in 1910. He and his wife, Ella, had the following children: Carl Sanders, b. 1892; Jere Scott, b. 1894; Samuel Samford, b. 1896; Arthur Bell, b. 1899; and Julia Darby, b. 1906. Samford P.' s sister, Fannie, is remembered as Miss Fannie Barron, who taught in her own and other local schools. It seems she would have married Dr. Battle, but she had a promise to care for members of her family. Fannie's sister, Alice, taught in the small, private Turner Academy. She later became a well-known insurance agent. Other Barron teachers included Mary and Josie who taught at Florala in 1901. The youngest son, Justus Mack, and his wife, Katie, had the following children: Justus Mack, Jr., m. Millie ? ; Samford Kierce, m. Elma Evelyn Fuqua; Susan, m. (1) Carol Aklfedtz, a Baptist minister (2) Charles Ford; Helen, m. Brogden Taylor; Alice, m. Bob Martin; and Patricia, m. Sam Dunbar. Samford P.'s brother, Joseph Newton, and his first wife, Della, reared 10 children: John Dudley, m. Emma Elizabeth Dawkins; Gertrude, m. ? Rushton; Subina, m. ? Turner; Genie, m. ? King; Donie, m. ? King; Fanny, m. ? Smith; Abby, m. ? Smith; Bonnie; and Cyrus "Cy." Joseph and his second wife had three children: Harry, Ebner, and Denford. There are a number of Barron descendants who currently reside in the area. Appreciation is expressed to one of these, Elma (Fuqua) Barron, for sharing the majority of the above information. Samford P. Barron was born in Meriwether County, Ga., on July 29, 1844, and died on December 25, 1921. When about three years of age he moved to Pike County, Ala., with his parents. He obeyed the gospel before the Civil War, while yet a young man. He was married to Susan Darby on November 1, 1866. Unto them six children were born, five of whom still live. Brother Barron moved to Andalusia, Ala., in 1875, where he spent practically all the remainder of his life, save three or four years in Florida. Brother Barron preached a great deal in and around Andalusia, and was instrumental in doing great good for the cause he loved so dearly. I knew and loved him as I have known and loved few men. I spent some three or four months in his home several years ago. He was humble and meek, tender and kind, gentle and loving, in his home life. I am a better man for having known and loved him. The first night I spent in his home he said: "Brother Bradley, I can get my family together only twice each day--at the evening and morning meals; therefore, we have prayer at the table. Lead us in prayer." After an absence of eleven years, I took supper with him again; and again at the table, before we were seated, he said: "Brother Bradley, lead us in prayer." I have never forgotten those two nights. Sister Barron died on September 8, 1921. She was a good woman and a dutiful wife. I expect to meet Brother and Sister Barron on the other side. Sister Susan D. Barron was born near Henderson, Pike County, Ala., on May 7, 1844. She obeyed the gospel under the teaching of Brother Robert W. Turner in the year 1861. She was married to Brother Samford P. Barron on November 1, 1866. She was a loyal disciple of Christ for sixty years; always cheerful, and loved by all who knew her, especially by children. Her counsel and advice have helped many to a higher and better life. Her kind and loving words often encouraged me in my early life as a preacher. Sister Barron fell asleep in Jesus, at her home in Andalusia, Ala., on September 8, 1921. She leaves a husband, three sons, and two daughters to mourn her death. We sorrow not, even as others who have no hope. No more sickness nor sighing nor death in the sweet home over yonder. -W. J. Haynes. Gospel Advocate, November 17, 1921, page 1128. 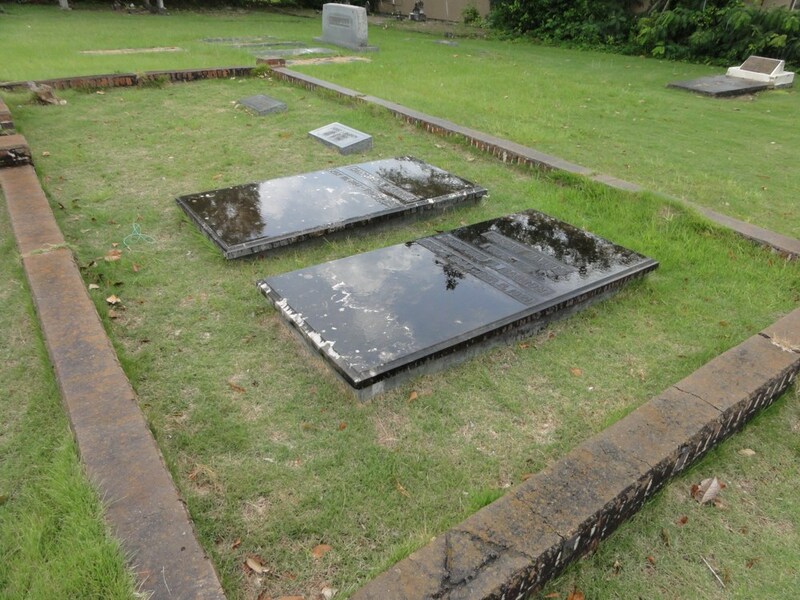 The Barron family are all buried in the Magnolia Cemetery in Andalusia, Alabama. Go to the square in downtown Andalusia. Go around the square and turn right on Crescent Street. The street will bear to the left. Then take the first right on Opp Street. The cemetery entrance will be on the right. Enter the cemetery, and head to the top of the hill. When the road makes a sharp turn to the left, stop the car. The Barron family will in the plot straight ahead. Special Thanks to Gary Hampton, who took the photos and gathered the information for this Page.